Actual Ethics offers a moral defense of the "classical liberal" political tradition and applies it to several of today's vexing moral and political issues. James Otteson argues that a Kantian conception of personhood and an Aristotelian conception of judgment are compatible and even complementary. He shows why they are morally attractive, and perhaps most controversially, when combined, they imply a limited, classical liberal political state. 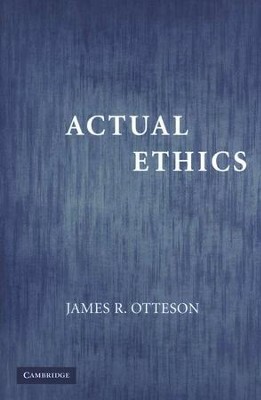 Otteson then addresses several contemporary problems---wealth and poverty, public education, animal welfare, and affirmative action---and shows how each can be plausibly addressed within the Kantian, Aristotelian and classical liberal framework. Written in clear, engaging, and jargon-free prose, Actual Ethics will give students and general audiences an overview of a powerful and rich moral and political tradition that they might not otherwise consider. James R. Otteson is the Chair of the Philosophy Department at the University of Alabama. With advanced degrees from the University of Chicago and University of Wisconsin, Otteson has written on Adam Smith as well as the Scottish Enlightenment in addition to the historic bases of contemporary ethics. Actual Ethics offers a moral defense of the 'classical liberal' political tradition and applies it to several of today's vexing moral and political issues. James Otteson argues that a Kantian conception of personhood and an Aristotelian conception of judgment are compatible and even complementary. He shows why they are morally attractive, and perhaps most controversially, when combined, they imply a limited, classical liberal political state. Otteson then addresses several contemporary problems - wealth and poverty, public education, animal welfare, and affirmative action - and shows how each can be plausibly addressed within the Kantian, Aristotelian and classical liberal framework. Written in clear, engaging, and jargon-free prose, Actual Ethics will give students and general audiences an overview of a powerful and rich moral and political tradition that they might not otherwise consider. I'm the author/artist and I want to review Actual Ethics.